Artist, Facilitator, Event Designer and Teacher has over 20 years experience in Building Community through the Rhythm and Arts. Ken has helped develop communities and events such as First Fridays (a monthly gallery hop), First Night Fredericksburg (founding member), The Drum Circle Facilitators Guild (founding director). Schools (pre through college), Libraries, Banks, Festivals, Church Retreats, Adult Care Facilities, and Corporations have all included Everybody Drum into their events as workshops, icebreakers or keynote presentations. Working with the various communities, we design successful programs that are fun, enlightening and exciting! 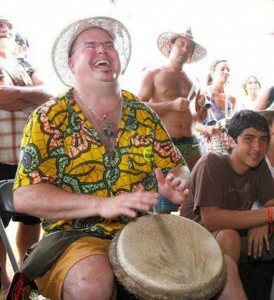 Ken has trained with Arthur Hull, Babatunde Olatunji, Mamady Keita, Keith Terry, Kalani, Essa Grayson, and Jaqui MacMillan and is a graduate of HealthRHYTHMS, Village Music Circles, and Drum Circle Music.